Blink and you’ll miss it. One moment the Matterhorn and its snowy peak is framed by your window; the next there are green hills carpeted with wild flowers of every hue. Drift off for a moment, and what looks like an Attenborough-esque documentary is taking place through the glass. An ibex lowers his long, curved horns to graze before – ears popping! – you’re rushing headlong into the inkiness of a tunnel. Upon emerging from the darkness, you glance out of the window to see the unmistakable deep blue of the ocean in the distance where circling birds patiently await the moment to plunge for their dinner. Creative licence aside, these are the kinds of experiences that await should you decide upon a cruise-and-rail holiday, where the only limit to what you’ll see is how long you can keep your eyes on the view outside the window. Rail journeys may be a byword for commuter misery here in the UK, but elsewhere in the world they remain a fantastic way to see the sights while enjoying luxurious accommodation and five-star dining. Combining rail and cruise gives you the best of both worlds, and the strongest possible reason to pack your bags and treat yourself to a change of scene – or rather a constantly changing scene. We’ve tracked down some of the world’s great cruise- and-rail pairings, on routes that range from snow-capped mountains to the blistering heat of Australia, so the only thing you have to do is choose. 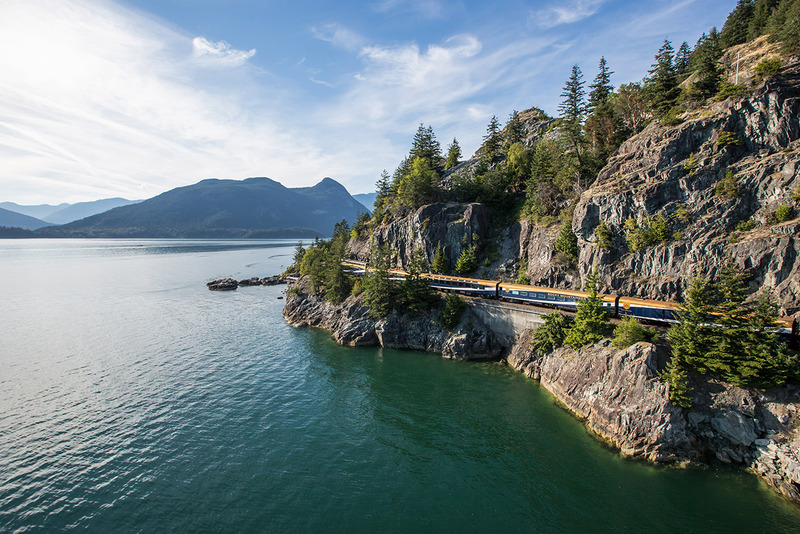 Perhaps the most famous of all cruise/rail combinations is offered by Rocky Mountaineer and Holland America Line. 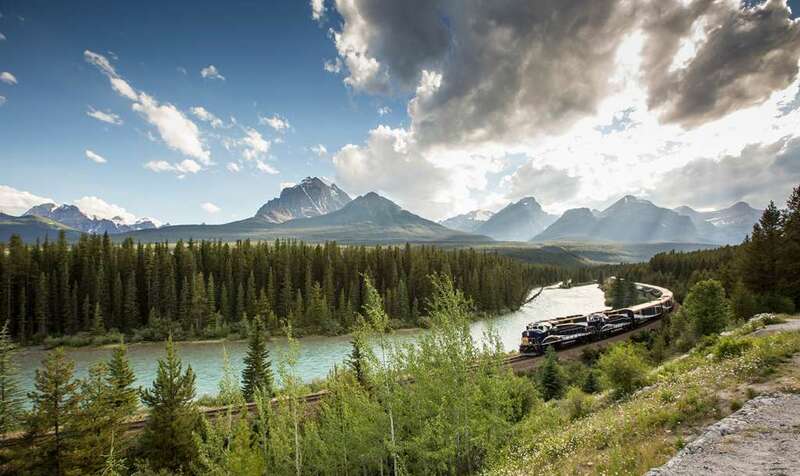 Since its inception in 1990, Rocky Mountaineer has grown to be the largest private rail company in the world, welcoming 1.7 million guests across its four spectacular routes in Western Canada. Hop on board and you can journey through the clouds to the 300ft Pyramid Falls; traverse the famous Spiral Tunnels, bored through solid rock by more than 1,000 men; or skirt the shores of Anderson Lake with panoramic views of sparkling blue water and towering mountain peaks. Whichever route you take – and they can be combined for a longer trip if you’d prefer – you simply can’t go wrong. Rocky Mountaineer offers two classes of travel: Silver Leaf and Gold Leaf, the main difference being that Gold means a bi-level carriage, allowing you to admire the stunning panoramas of the Rocky Mountains from the top deck before retiring downstairs to enjoy your gourmet meals. And at night there’s no squeezing yourself into a cramped couchette: whichever class you travel, all stops include an overnight stay in a comfortable hotel. The natural counterpoint to the Rocky Mountaineer has always been an Alaskan cruise. There’s a huge choice of these (see page 22 of this issue for some of our favourites) but Holland America has an established relationship with Rocky Mountaineer. They offer a brilliant 20-night cruise-and-rail package, including five days on Rocky Mountaineer, from £5,855 (departing August 12; Rocky Mountaineer) plus all the highlights you could want from an Alaskan cruise: gorgeous landscapes, incredible wildlife and bucketloads of adventure. You don’t need to travel halfway across the world to experience the unique pleasures of a cruise-and-rail holiday. Simply cross the Channel and you’ll find many enticing options on our European doorstep. 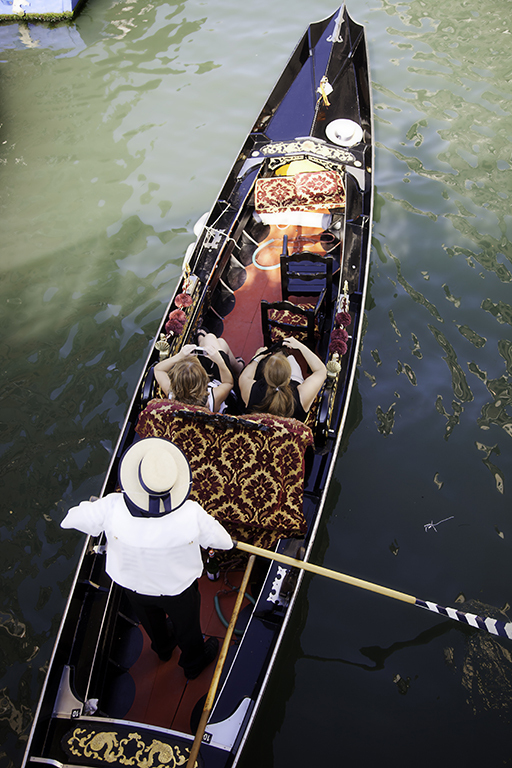 How about customising a Mediterranean voyage – and cutting out the Bay of Biscay – with a train ride from London to Venice? Not just on any train, mind you, but the famous Orient Express. Made up of splendidly Art Deco carriages from the 1920s and 30s, this railway legend will carry you overnight through the vineyards of France, the chocolate-box towns of Switzerland and the snowy Alpine peaks, while immaculately uniformed staff offer you five-star service and fine dining. And with passengers encouraged to dress up for the journey, this is practically a time machine, whisking you back to the golden age of rail travel (hopefully without needing to trouble Monsieur Poirot). From Venice onwards, your cruise options are almost limitless, but if you’re pushing the boat out it’s hard to overlook Azamara Club Cruises, whose small ships are perfect for exploring the less visited ports of the Eastern Mediterranean and the beautiful coastlines of Croatia. Azamara offers a three-night land package, including the Orient Express, followed by a seven-night Mediterranean cruise, with prices from £5,124, departing August 19 (Azamara Club Cruises). If river cruising is more your style, Riviera Travel has put together a tempting package that includes seven nights on the Rhine. Heading towards Switzerland, you’ll be able to enjoy all the famous views this wonderful corner of Europe has to offer, including the Rhine Gorge, the Black Forest and those awe-inspiring Alpine peaks. But who wants to view the mountains of Switzerland only from below? The real experience is up there in the clouds, so once your Rhine cruise has come to an end, treat yourself to a trip on the Glacier Express. Cheekily calling itself the slowest express in the world, this remarkable train sets off at the base of the Matterhorn and makes a gradual ascent – via no fewer than 291 bridges and 91 tunnels – to an altitude of 6,670ft at the Oberalp Pass. From up here the mountains loom even larger over this landscape of verdant valleys, carpeted with flowers in spring (Rhine cruise with Glacier Express extension, 11 days from £2,418pp; departures from May to September, see Riviera Travel). The west of Scotland attracts nature-lovers from all over the world, but a cruise in these waters is not for those who prefer to sit back and let the scenery unfold before them. To get the best out of the West Highlands and the Hebrides that lie off their rocky shore, you need to be out and about. That’s the experience you can look forward to with Hebridean Island Cruises, whose “A Taste of the Outer Isles” itinerary (four nights from £3,060, departing August 31; see Hebridean Island Cruises) takes in plenty of remote landscapes that – happily for you – don’t get the footfall their beauty deserves. You’ll feel the fresh, clean air on your face as you hike across the wild terrain of the Outer Hebrides looking for rare birds and other wildlife – and, believe us, you’ll earn that warming dram of whisky at the end of the day. For the rail portion of your holiday, you can pair this cruise with something very special. The Royal Scotsman has been carrying passengers through the Scottish Highlands in the lap of luxury for more than 30 years now. The “Scotland’s Classic Splendours” itinerary (four nights from £4,605, departing August 27; see Belmond) features many of the country’s most famous sights, including the castles of Eilean Donan and Glamis, but the star of the show is the Royal Scotsman itself. Operated by Belmond – who also run the Orient Express – this five-star train carries just 36 passengers in its ten mahogany-lined carriages, offering the luxurious appointments of a Scottish country-house hotel and a guest-to-staff ratio of three to one. Whether you simply want to watch the world go by from the Observation Deck, explore the tastes of Scotland (game and fresh fish, of course) in the elegant dining carriage, or indulge in a little pampering at the Bamford Haybarn Spa (yes, there’s even a spa on board), this is rail travel like you never imagined. 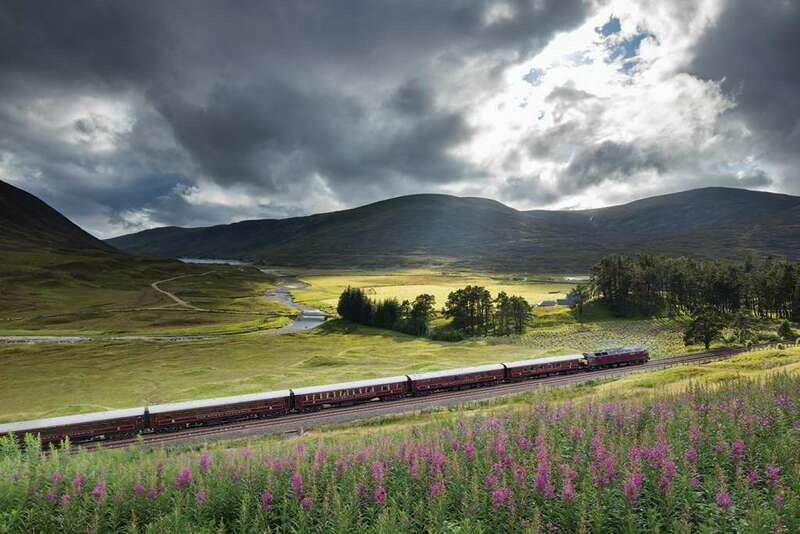 Ultra-luxury comes at a price, naturally, but you can explore Scotland’s tracks for considerably less with Great Rail Journeys, who offer an eight-day “Hebrides and the Highlands” itinerary for £1,565 per person. There are exciting excursions and luxury hotel stays included in the cost, but it’s the five-star scenery outside the window that really sticks with you. Think of Australia and you may imagine shimmering white sands, dotted with golden-skinned surfers tending their barbecues, perhaps with a kangaroo or two in the background. But that world exists only on the fringes of this mighty continent, just ten per cent of which is habitable. 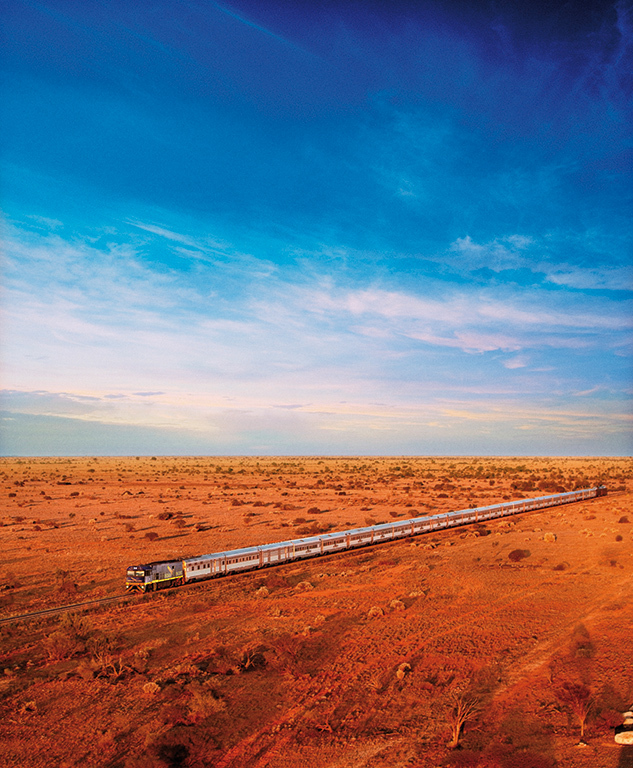 The rest is largely empty – barring the unlikely flora and fauna that have adapted to survive there – and it’s this Australia that you’ll see from the famous Indian Pacific railway train. The route runs from Perth to Sydney – a staggering 2,704 miles from the Indian Ocean to the Pacific. During your three-day transcontinental journey you’ll visit proud cities (Adelaide) and failed gold rush towns (Cook) but mostly you’ll see a whole lot of nothing. And that is the point. Those endless miles of red desert can inspire feelings of isolation akin to being on an alien planet – and until Mr Branson builds one of his railways on Mars, there is simply nowhere like it. Happily, on your side of the double-glazed window it’s all air-conditioned luxury, with amazing meals prepared on board, and comfortable beds to retire to each night. And waiting at the end is Sydney, that cosmopolitan city of glorious beaches and gorgeous people (“Discover Australia & New Zealand” itinerary from £5,899, see ROL Cruise). After so much desert you’ll need plenty of water, and luckily Sydney is also one of the world’s great cruise ports – so how about a 12-night trip across the Tasman Strait to Auckland, New Zealand, aboard Celebrity Solstice? A nation of rolling green hills and plunging waterfalls, New Zealand feels like something out of a fantasy movie – but what would you expect from the land where they made the Lord of the Rings films? Cruising has always been a brilliant way to see New Zealand, as the country’s ports are within a short distance of its many natural wonders. Celebrity’s cruise (prices from £1,660, departing November 8; see celebritycruises.co.uk) takes in all the highlights, including Milford Sound – the famous fjord in South Island that’s home to seals and penguins – plus Akaroa, an old French-colonial town at the foot of an ancient volcano, and the major cities of Wellington and Dunedin, the latter a beguiling mixture of Scottish and Maori heritage. And Solstice herself is a highly impressive ship, accommodating 2,852 passengers in luxury and style. She was also the first of Celebrity’s fleet to feature the Lawn Club – half an acre of real, living turf on the top deck, which is just perfect for scenic cruising with a cocktail in hand. And with excellent speciality restaurants (including the wonderful Asian flavours of Silk Harvest) to look forward to, you can be sure of a memorable trip. If, for whatever reason, traversing the worlds of Frodo and Crocodile Dundee is not enough excitement for you, then nothing else will do but an epic African adventure. 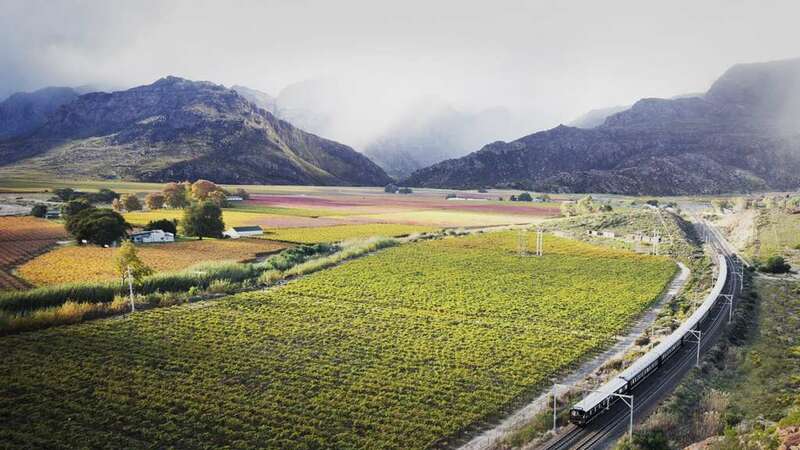 Rovos Rail do a variety of luxury rail journeys across the south of Africa where you can witness all the incredible sights that this part of the world has to offer. Eager to experience all the thrills of being on safari? They have a Namibian journey which can accommodate that. Want to witness one of the great natural wonders of the world, the Victoria Falls? Then you’ll want to book yourself on their journey across the plains of Botswana and Zimbabwe which takes you there. But the journey we want to highlight is one which takes in the gem of Africa itself: South Africa (two-night journey from Pretoria to Cape Town, prices approx. from £1,150 departing August 10, 2018). Starting in Pretoria, known as the Jacaranda City for the thousands of jacaranda trees which line the streets, you’ll be taken on a 1,600km whistlestop tour of South Africa and all her highlights. Travel through the grasslands of the gold-rich Highveld (keeping an eye out for mountain zebras on your way) to the barren desert land of the wonderfully named Great Karoo where you’ll slowly wind your way through the mountains en route to Cape Town. One of the more interesting stops you’ll make on your way is to the old Victorian village of Matjiesfontein. Founded in 1884 by the Scottish railwayman James Douglas Logan, this little slice of history feels like a glimpse into a South Africa that doesn’t exist anymore and as an added bonus has a rather splendid spa. You’ll know when you’ve made it to Cape Town as you’ll spot the formidable presence of Table Mountain, Devil’s Peak and Lion’s Head looming in the background. Quite the sight to see on the approach from the train. Once you arrive in Cape Town you’ll no doubt want to stretch your sea legs and you won’t be short of choice for cruise lines offering a scenic journey around the cape of Africa. Cunard offer one of the more visually appealing routes (16-night cruise from Cape Town to Southampton, prices start at £2,845 departing April 12, 2019) where you’ll sail up the west coast of Africa, taking in the gorgeous coastline of beaches, mountains and intriguing coastal towns. It may be a cruise of few stops – just the four in fact – but with Cunard’s five-star service to go along with the five-star views, well, we don’t think you’ll mind too much. So what are you waiting for? Get on the phone and transform the view out of your window with the cruise – and rail – trip of a lifetime.